Even one missing tooth can affect the look and feel of your smile. Premature tooth loss can dramatically impair your ability to comfortably eat, correctly pronounce certain words, and confidently smile. A dental implant is a tooth replacement designed to look and function just like a natural tooth. Implants offer various benefits over traditional restorations and can last a lifetime when they are properly cared for. ﻿Dr. William Davey Crockett and his team combine innovative in-office tools, a gentle technique, and extensive dental training to bring implant dentistry to his patients. We want every patient to achieve good oral health. We provide comprehensive treatment for dental implants at our practice in Richmond, VA. 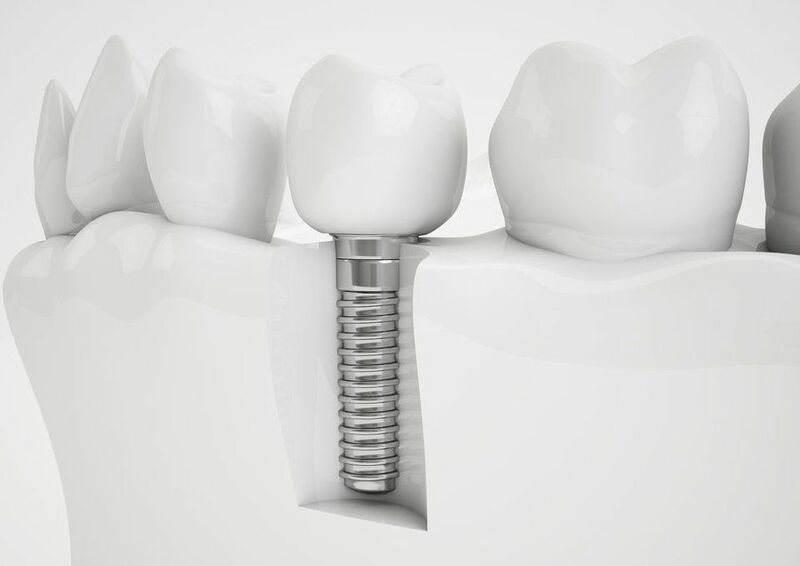 Dental implants are titanium posts that replace a tooth root. They are a strong, stable base for your permanent restorations. 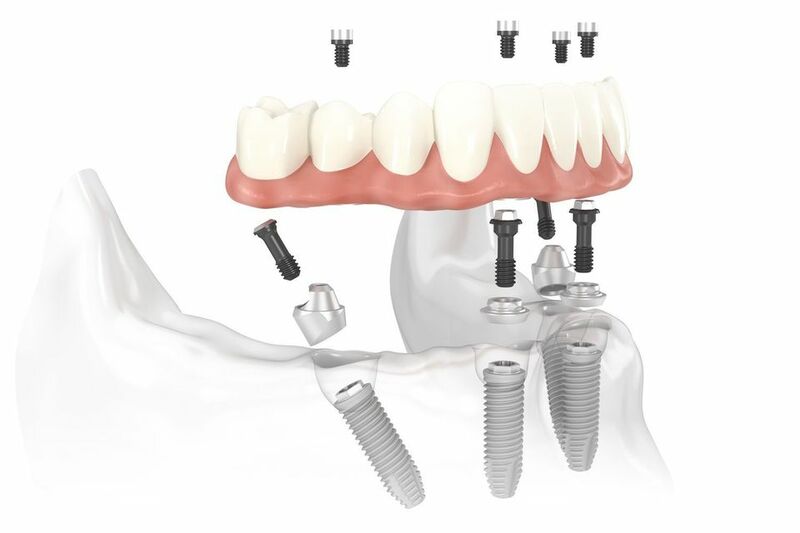 Implants are highly versatile and can anchor a dental crown, dental bridge, or denture directly to your jawbone. Because implants are surgically implanted in the jawbone, you can rest assured that your new restoration will stay in place when you eat, speak, and smile. A dental implant replaces both the tooth and its root in order to provide a more stable, comfortable substitution for a missing tooth. If you are interested in dental implants, Dr. Bousaba will first conduct a complete oral and overall health evaluation to make sure it is a good fit for you. During his evaluation, he will use digital x-rays and 3-D computerized tomography (CT) scans to examine the health of your jaw. If you have lost jawbone density due to a missing tooth, Dr. Bousaba may recommend bone grafting or a modified dental implant procedure known as All-on-4®. If your x-rays reveal that your sinuses are too close to the upper jaw, Dr. Bousaba may also recommend a sinus lift. Dental implants are placed in a relatively simple surgical procedure completed over several steps. If you need additional procedures such as bone grafting or a sinus lift, you will need to undergo these procedures several months prior to your implant placement. As a comprehensive dentist, Dr. Bousaba can perform these preparatory procedures in-office. When your bone is fully healed, you will be ready for your dental implants. You will be discharged on the same day of your surgery so you can begin your recovery. Although the healing time varies from patient to patient, it usually takes between four and six months for your implants to fuse with the surrounding jawbone tissue. Because it can be a few months before you are ready to wear a permanent, implant-supported restoration, Dr. Bousaba can also provide teeth-in-a-day or a same-day denture. These restorations are more stable than traditional temporaries and allow you to chew and speak with confidence during your recovery. During this time, you should avoid habits like smoking, which has been linked to dental implant failure. Once you are fully healed, you will come back to our office for the second phase of your surgery. During the abutment placement, Dr. Bousaba will attach anchor-like abutments to your dental implants. These attachments serve as the bridges that connect your implants to the final restoration. After a few days, your gums will be fully healed from abutment placement and we can begin designing your custom restoration. Crowns: Implant-supported crowns are a great fit if you are missing a single tooth. Bridges: Dental bridges can replace multiple teeth and are typically supported by two tooth implants. Hybrid restorations: These fixed, implant-supported dentures provide superior stability over traditional dentures. Dr. Crocket typically places these hybrid restorations over All-on-4 implants. Every restorative treatment is designed with your facial features in mind to look and feel as natural as possible. Our office has an in-house ceramist who will carefully craft your restoration according to your unique needs. A hybrid restoration minimizes the number of implants you need so that you can enjoy a full smile without extensive surgery. Promote jawbone health: Implants prevent further jawbone recession. Preserve facial structure: Missing teeth and the subsequent jawbone atrophy can make your face and cheeks look sunken. By replacing missing teeth will dental implants, you can maintain a full facial structure. Prevent further tooth loss: Leaving missing teeth untreated can lead to additional tooth loss. Dental implants help you keep your remaining natural teeth. One of the most attractive benefits of dental implants is their success and survival rates. The Institute for Dental Implant Awareness compiled several clinical studies showing that dental implant treatment is successful over 95 percent of the time. Dental implants are built to last a lifetime. With proper care and frequent visits to our office, they can. There are various options for patients who do not want to receive traditional implants. If you are a good candidate for All-on-4, Dr. Bousaba can perform this procedure in one appointment. Because All-on-4 requires fewer implants, it is a good option for patients who do not want to undergo bone grafting or those who want immediate implant restoration. During the procedure, Dr. Bousaba will place four posts in your jaw. The two back posts are placed at a slight angle, which maximizes stability in the jawbone. If you are interested in All-on-4, Dr. Bousaba can evaluate your case and determine whether you are a good candidate during your consultation. We are happy to work with you to provide dental care that meets your budget. Our office provides payment plans and works with outside lender CareCredit® to make dental implants accessible and affordable. At our practice, we believe that every patient should have access to tooth replacement. If you are on a budget, All-on-4 treatment typically requires fewer materials and can be completed at a lower cost. We are happy to work with you to provide dental care that meets your budget. Our office provides payment plans and works with outside lender CareCredit® to make dental implants accessible and affordable. Superior technology: Our in-house CT and x-ray imaging technology allow us to precisely plan and perform your procedure. Comprehensive care: Many dentists refer dental implant treatment out to oral surgeons. However, Dr. Bousaba performs the dental implant procedure and necessary bone grafting in our office, allowing you to receive care under one dentist. Advanced training: Dr. Bousaba has completed advanced training in implant dentistry and other areas to provide his patients with outstanding care. Sedation options: We are committed to your comfort and offer various sedation options to suit your needs. As a result of our patient-centered care, we have received many positive reviews from our patients. Curious about How Implant Dentistry Can Help You? Dr. Bousaba and his team can guide you through implant treatment from start to finish. Whether you need replacement teeth for a single tooth or a full arch, we can perform your treatment from start to finish in one place. Call our dental office in Richmond at (804) 282-2990 or message us online to schedule your implant consultation.